Popular Baltimore restaurant Birroteca is getting a second location out in Harford County’s Bel Air. The Italian restaurant is known for its artisan pizzas, fresh pastas and craft cocktails. The Bel Air location will open Oct. 22, according to Bel Air Birroteca General Manager Jonathan Angel. The original Birroteca location is just outside of Hampden. Owner Robbin Haas also owns the Nickel Taphouse in Mt. Washington, which opened about a year ago. Read more about the Bel Air location in The Baltimore Sun. 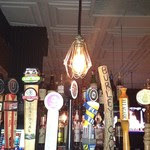 This entry was posted in Baltimore food and drink, Food & drink and tagged bel air, birroteca, diane macklin, downtown diane, hampden, harford county, mt. washington, nickel taphouse, robbin haas. Bookmark the permalink.